As I write this, we are sitting at the gate in the airport waiting for our flight back to the US. A few days ago, I heard about the new Star Wars campaign that Glico was going to be starting in Japan on July 2nd. That happened to be the day we were leaving Japan, so I wasn’t sure I would be able to see any of the stuff in stores. But we stopped at a convenience store in the airport, and sure enough, they had a number of the candy products on the shelves. I picked up a few boxes of stuff just for the heck of it. Pocky is a classic Japanese candy, although I’m not a huge fan of it. I’ve never tried “Cecil” before, but it appears to just be chocolate. 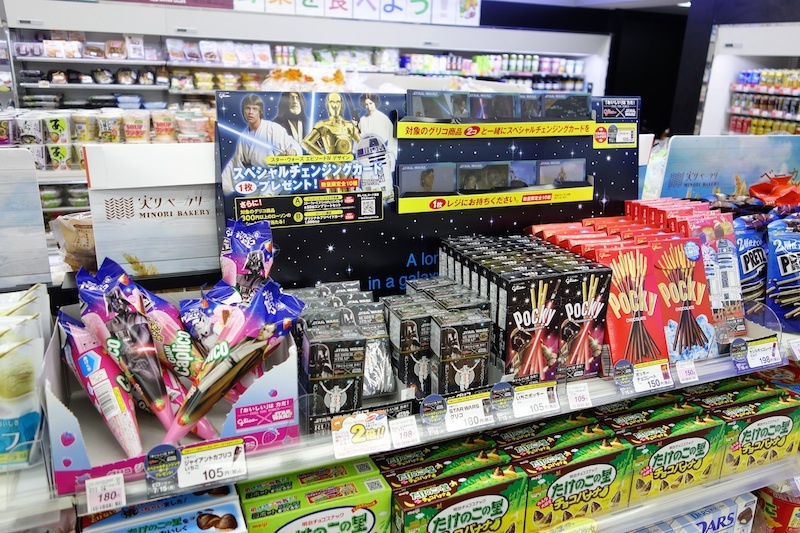 You can also get a lenticular trading card with every two Glico Star Wars products you buy. The most interesting thing to me were the rubber cell phone straps since I didn’t know about them. They come with a few pieces of candy, presumably because Glico doesn’t have the license to just sell the straps. There are 10 possible characters you can get, and at first I didn’t notice that Jabba was on the list. Luckily, I checked twice. I ended up buying 8 packs (they’re a little under $2 apiece) and got 7 unique characters (including Jabba) so I was pretty happy with that. In the past, items like these would have come with thin straps designed to fit thorough the wrist strap holes in cell phones, but now that most smartphones don’t have those holes, they are increasingly coming with plugs that can fit into your earphone jack. Anyway, I was pretty excited to find a Jabba collectible I never even knew about, literally a couple of hours before leaving Japan. Nice find, icruise. Any sign of new Millennium Falcon collectables? I did see a kit where you can make a Millennium Falcon out of metal sheeting, but I thought maybe you already had one?